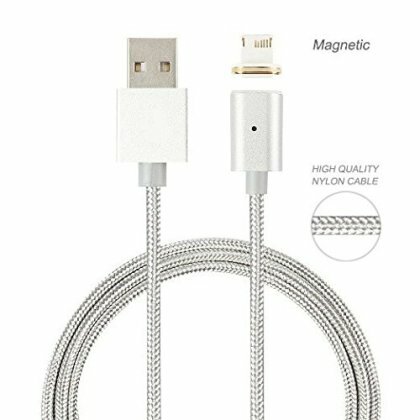 Compatibility with iPhone SE, iPhone 6s/6s Plus, iPhone 6/6 Plus,iPhone5/5c/5s, iPad Air, iPad with Retina Display, iPad mini, iPod Touch 5th gen, and iPod Nano 7th gen.
Nylon braided and aluminum casing.Fast Charge Speed High Quality USB 2.0 Sync Data Charger Cable.Can be used as anti-dust plug.15 Month Warranty By SweetLF. Strong magnetism makes it easy for Clik to connect without looking even in the dark, when they get near they automatically connect,LED indicates connection. Two 8 pin plug both obverse and reverse sides can be plug, one-handed operation, convenient and fast,also can improve the safety of driving the process. Detachable magnetic connector, Easy to connect, easy separation, reducing abrasion during inserting or pluging out the cable.Never again worry about breaking your lightning port.